Serendipity: Miriam-Webster defines it as “the phenomenon of finding valuable or agreeable things not sought for.” Dictionary.com defines it as “good fortune; luck.” To me, when something serendipitous happens, it’s more than dumb luck or pure chance; there’s a reason for it. It may or may not be immediately obvious, but there’s a reason. Serendipity, when it happens, always makes you feel good, as though there’s someone out there looking out for you, giving you the thumbs-up. I think that’s really what it is. Serendipity is a little thumbs-up sign from the universe, or God, or whomever you choose to attribute it. Elizabeth and I experienced what I can only label as a serendipitous moment on the Friday before Christmas. It wasn’t anything huge, just a little thumbs-up sign from the cosmos, or maybe it was just the spirit of John Denver and Jim Henson messing with our minds for kicks. It was after midnight on Friday night, and Elizabeth and I were both awake, which is highly unusual in itself. Normally, we’d both have been asleep for an hour or two by then, being the typically middle-aged people we are. But this was the night before Christmas Eve, and Elizabeth was smack in the middle of what I like to call “Christmas Crazy.” At midnight on Friday, this meant baking about sixteen different kinds of Christmas cookies, cupcakes, and various goodies, in preparation for the big Christmas Eve party that we host every year. Generally, this is the biggest event of the year at our home, although birthdays, graduations, and a couple of funerals have sometimes rivaled it in size. It’s generally in the range of forty to fifty people, and Elizabeth feels underprepared unless each guest can have a platter’s worth of baked treats to themselves. I, on the other hand, was up because I was running a fever, and feeling generally lousy. I had been fine all day, but around eight that evening I felt like I had been buried under a load of bricks. Not a good way to feel when your Christmas Eve party is less than twenty-four hours away. After dozing for a few hours, I had woken up with a fever and chills, and although I was miserable, I was mostly awake. Doesn’t sound much like the makings of a serendipitous moment, does it? We sat there, watching Jimmy Fallon’s late night show. Well, technically, neither of us was sitting; I was lying down, head propped up by pillows, and I don’t know what you’d call what Elizabeth was doing. She’d pop in periodically, watch a few seconds of the show, and then the timer on the oven would go off, and she’d zoom back to the kitchen to rotate her cookies, or whatever it was she needed to do. She might sit down, or maybe just pause there behind the chair, but before long, DING! would go the oven, and she would become this blur. Like a hummingbird, always in fast forward, except for hovering occasionally to take a sip of sugar water (Coke), or sitting perfectly still for a few moments before zipping away again. In fact, in my semi-dazed mind, I thought she’d make a great superhero. I was going to suggest calling her The Hummer, but that has a totally different, and possibly inappropriate, connotation. Perhaps instead, The Blur. Her superpowers would include not only the ability to run like the Flash, but also the ability to distort people’s vision so they can’t see clearly (as an example, I thought I was seeing small elves around the Christmas tree), all while continuously whipping out batch after batch of peanut butter blossoms, each one cooked to perfection. 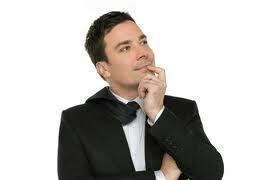 So, where’s the serendipity in that, and what does Jimmy Fallon have to do with any of this? Well, we haven’t gotten there yet. In my mind, I’m still picturing The Blur. If there were a super called The Blur, just what would his/her costume look like? I’m imagining it looks something like the TV does, when you turn it on before you turn on the DirecTV receiver. You know, that fuzzy, grayscale blizzard effect. Probably wouldn’t look so hot in spandex, right? Well, now you know why I’m not a comic book artist. My imagination doesn’t lend itself to red tights and a cape. Anyway, it just so happened that we were both present and conscious as Fallon’s show reached its final segment, which turned out to be a musical number with Fallon and two Muppet guest stars, Kermit and Robin. Elizabeth and I squinted at each other in the relative darkness of the room, to make sure we concurred on what we were seeing. 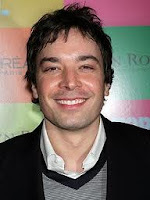 Jimmy began talking about how much he loved the Christmas album that the Muppets did with John Denver, and how much he loved some of the lesser-known songs on it. Now, I had just finished writing a post in which I praised that very same album, for the very same reasons. Feeling the serendipity now? Well I was, and it immediately jumped off the chart when the three of them broke into a rendition of “When the River Meets the Sea.” This song is not only my favorite song on that album, but one of my favorite songs ever. In the post “Musical Christmas stockings,” I talked about how the song “When the River Meets the Sea” is like getting a soul massage. That is true. One of the reasons I most look forward the holiday season each year is because I know that song is coming back, and I will feel better inside after hearing it. We don’t play it very often, even at Christmas; some years I’ve only heard it once, but I always make sure I hear it. I also don’t play it except at Christmastime, even though we own the CD and could listen to it anytime I choose. Maybe it’s just superstition, but I don’t want the song to lose any of its power by overexposing myself to it. I don’t know if that makes sense, but that’s how I feel. You know, maybe serendipity is really nothing more than a coincidence to which we assign greater significance. If it is, I’d be okay with that. I wanted to embed the youtube video of Fallon singing "When the River Meets the Sea," but apparently youtube has a problem with that. I don't know if it's a philosophical or technical issue, but it refused to locate the video I wanted to embed. The only other video post of the same segment has really crappy audio, and you can hear the guy in the background, cranking up his Lazyboy while he records the song off the TV. So, instead of embedding, I am providing the direct link to the video on youtube. 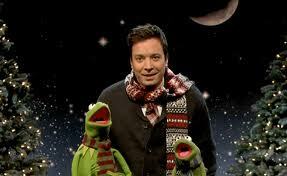 Just click it, and you can hear a reasonably clear version of Fallon singing with Kermit and Robin. Please accept my apologies on behalf of youtube for the inconvenience. Update: 8/28/13 Sorry, the links to the video no longer work. That's the thing about serendipity. It's all about the timing.